A fundamental part of MCM style is the unique plant life that adds texture and color to any space. Yucca, Succulents, Cacti and Jade are all great options to line your backyard fence or sit near the water’s edge. 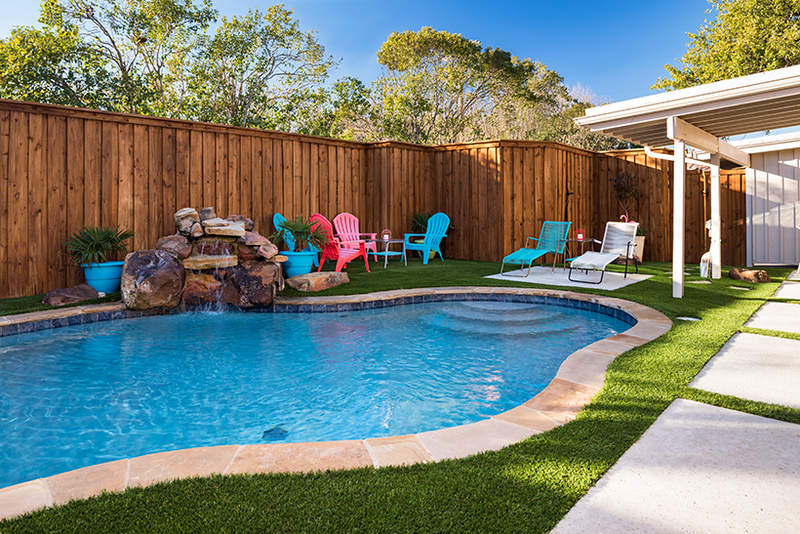 This MCM pool takes on an eco-friendly vibe by using astroturf instead of grass and welded iron sculptures instead of live plants. 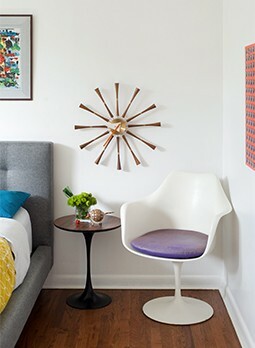 The look is still midcentury, but requires less maintenance. Photo by Bret Gum. 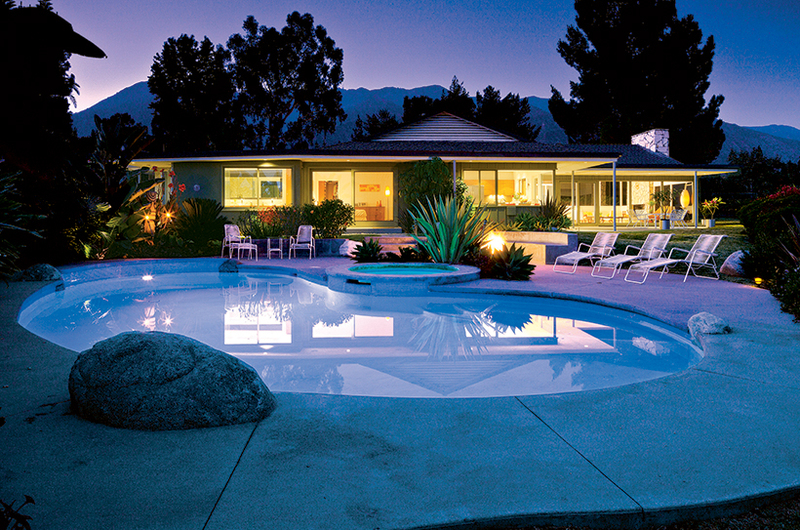 Cement is an essential part of having a pool, but it doesn’t have to cover your whole backyard. Mix up your terrain with patches of grass, rocks and dirt to add visual interest and cater to your chosen plant life. Colorful lounge chairs create a small seating area near the pool for visitors to relax and visit. Lined cement slabs provide a walkway in the grass, and a rock waterfall creates a serene ambiance. Photo by Guadalupe Garza/Twin Shoot Photography. 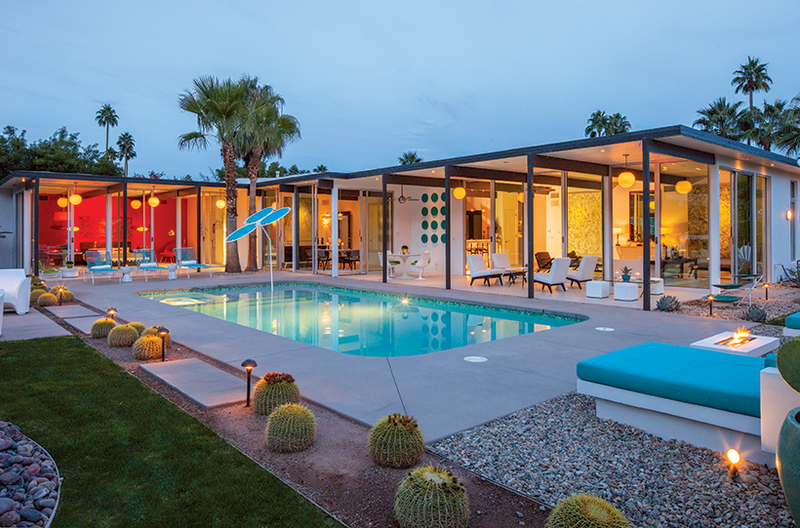 Break out your lounge chairs and patio furniture, because MCM pools are all about relaxing retro style. Bring out several lounge chairs in different colors around the water line to provide a place for your guests to relax and soak in the sun. Set up a table with tulip chairs for an eating area that’s always ready for snacks. 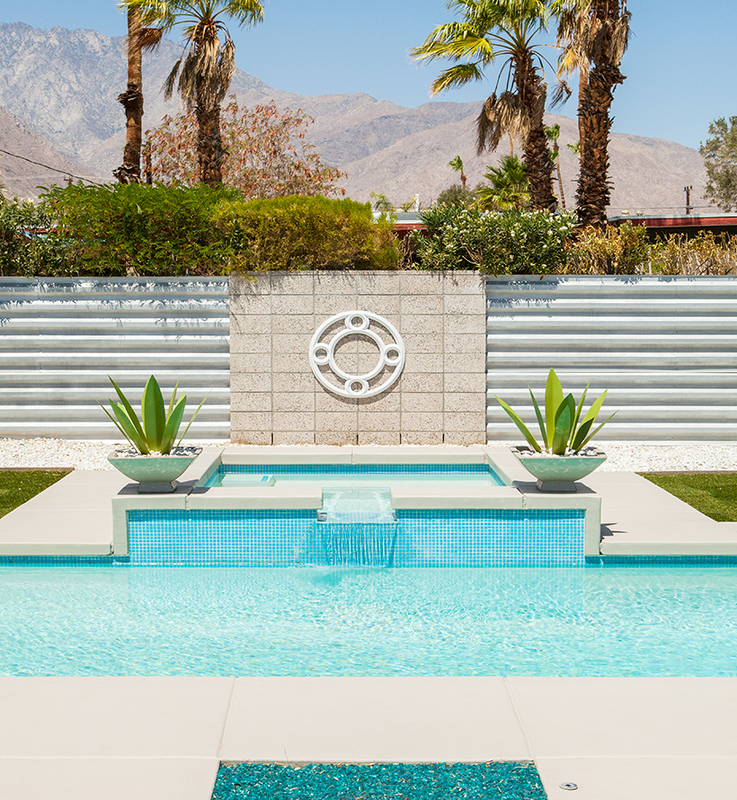 Large boulders and a few plants line this kidney-shaped pool, paying homage to MCM style while maintaining a minimalist look. Photo by Jim Brown. Use your lounge chairs and plant pots to add retro colors to the space that will complement the bright blue water. Set snacks on colorful dishes and pick fun cups for beverages. Red, blue, yellow and orange are great colors to provide that retro vibe. This backyard uses the home interior as a colorful backdrop to their pool setup. Multiple lounge chairs and seats make it the perfect place to host parties during the summer. A dirt pathway provides a home for multiple cacti, while rock, grass and cement separate different entertaining spaces. Photo by Jim Brown. If you’re fortunate enough to have an MCM exterior, it will play a role in being the background to your pool area. Use glass walls to your advantage to make your interior seem as if it’s part of your backyard. Create a seamless transition from outside to inside, using your interior color palette to play a role in how your backyard is perceived.